Drains and/or extracts waste oil from cars and light commercial vehicles, Drain bowl capacity of 20 litres. Holding tank capacity of 100 litres. Clear viewing inspection bowl capacity of 8 litres. Maximum working height 1600mm to 2000mm. Suction hose includes a rubber grip and a non drip cap. Portable and lightweight with a 6.5 litres reservoir capacity. 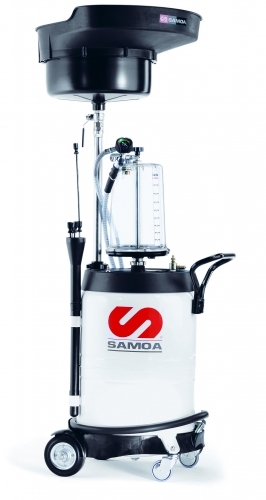 Ideal for extracting waste oil from motor vehicles, motor bikes, marine engines, lawn mowers and stationary engines. Automatic shut off when waste oil or water is extracted. Can also be used for salt water (bilge) and water. Complete with probe kit to suit various dipsticks. Ideal for busy workshops extracting oil directly from the car’s dipstick meaning more services easier and more efficient. Flow rates of 10LPM. Twin skinned tank consists of an internal HDPE tank surrounded by an integrated galvanised sheet steel bund. Suitable storage of fresh oil, waste oil and diesel fuel. GSM system provides instant tank level monitoring. Two alarms (minimum and maximum levels) can send a message to one or more telephone numbers or an email address. Transmitted with a dual band GSM modem can control and manage up to 8 tanks. Suitable to be used on fuel, oil or waste oil bulk tank applications. Alarm messages are sent straight to the supplier or the plant maintenance technician. Fluid tank level management made easy.